Fully Automatic high-speed paper cup machine LBZ-LAB Model was developed on the basis of imported technologies and combination of advanced domestic and foreign technologies.It's the first creation at home.It can automatic feed paper,weld through ultrasonic wave(binding the cup wall),oil,punch,heat,knurl,roll side,discharge cups,continually process,test through photoelectric cell,alarm upon encountering troubles and count.It is a good equipment to produce double-side PE-coated beverage cups,ice cream cups and coke cups. Fully Automatic high-speed paper cup machine LBZ-LAB Model was developed on the basis of imported technologies and combination of advanced domestic and foreign technologies.It’s the first creation at home.It can automatic feed paper,weld through ultrasonic wave(binding the cup wall),oil,punch,heat,knurl,roll side,discharge cups,continually process,test through photoelectric cell,alarm upon encountering troubles and count.It is a good equipment to produce double-side PE-coated beverage cups,ice cream cups and coke cups. JBZ-B PAPER CUP MACHINE is an automatic machine with multi-working station. It produces one-side film-coated paper cup through the procedure of automatic paper feeding, sealing, oil silicon lubrication, bottom punching, heating, knurling, curling and cup discharge. This kind of cup can be for tea, coffee, milk etc. 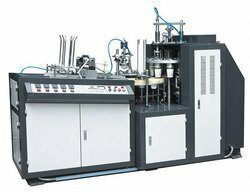 Looking for Paper Cup Making Machine ?